In 1828 James Williams , a nephew of Thomas Williams the famous Parys mine manager, and his wife Frances founded the Anglesey Association for the Preservation of Life from shipwrecks, following the sinking of the sailing ship Alert with the loss of all 140 people on board. It was not until 1867 that the RNLI decided to open a station at Bull bay. The Marquis of Anglesey gave a site and the building cost £158 to erect. A Miss Anglesey gave £400 to allow a 32ft boat to be purchased and the lifeboat was in service in 1868. To mark the occasion rock cannon were fired from Parys mountain. 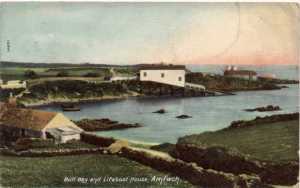 The boat ” Eleanor” was delivered to the Amlwch railway station from where is was taken by horse and cart to the new life boat house in Bull bay. It was not until 12th February 1871 when she was first launched to save the crew of the schooner “Albion” . Lifeboat Eleanor was also used to rescue 20 passengers from the SS Dakota which ran aground in 1877. In 1884 “Eleanor” was replaced by the 34 foot self-righting Woolfe & Son boat called “Curling” which was named after a Miss Curling of Camberwell who provided the RNLI with £290 to buy her. The Curling was called out 6 times in her 5 years at Bull Bay. She was replaced with another self-righting boat also called “Curling” built by Henderson & Co at a cost of £441. In 1890 John Hughes the coxswain of the Bull Bay life boat since 1868 received the RNLI Silver medal. However, the Curling continued to give good service until 1903. For a few years a temporary boat called “Anne Collin” was stationed at Bull Bay until in May 1904 “James Cullen” a 38ft Watson Class non self-righting boat was provided at a cost of £993. She was provided out of the legacy of Miss Marianne Cullen of Nottingham and to accommodate the Life boat a new boat house was built at a cost of £2000. It remained in service until June1924 when the RNLI decided to close the station. In 58 years the bull bay life boats were launched 41 times saving 63 lives and 7 ships during that period.